Britt Festival -Britt Music & Arts Festival, a non-profit organization, is the Pacific Northwest’s premier outdoor summer performing arts festival. 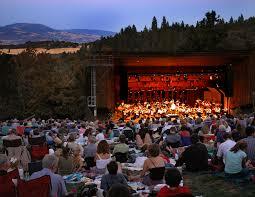 Located in the historic 1850s gold rush town of Jacksonville, O regon(USA), Britt presents dozens of summer concerts, featuring world-class artists in classical music, jazz, blues, folk, bluegrass, world, pop and country music. Britt’s performance venue is a naturally formed amphitheater set among majestic ponderosa pines and native madrones on the beautiful hillside estate of 19th century photographer Peter Britt. Viewing a map of the facility will give you a clearer picture of how we have combined stadium seating within this natural setting. Tens of thousands of music lovers travel from all over the West to enjoy Britt’sworld-class performances, spectacular scenery and casual, relaxing atmosphere. Biking – Jacksonville and Applegate Valley off some of the best biking you can find. With hilltop vistas and twists and turns, there’s a variety of levels for bi-pedal enthusiasts. Either sticking to the flat ground or thrill seeking on a mountain trail, there’s so much to see. 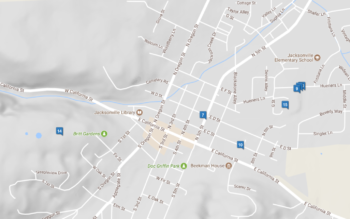 With the local bike shop Cycle Analysis located in the heart of Jacksonville off of main street, choosing to cycle your way through this Southern Oregon gem, is a terrific way to get to know the area. Check out one of the many Trails here. Hiking- When you are surrounded by such incredible natural beauty it is impossible to not want to get outside and experience it. Whether you are a regular hiker or someone who just wants to stretch their legs and breathe deeply of our fresh air there are several easily accessible hiking trails close to Jacksonville. 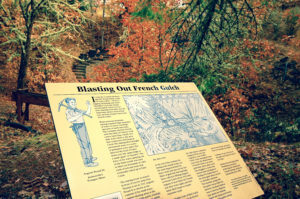 Right in town there are the Jacksonville Woodlands Trails – over 20 miles of trails to hike or run, including narrative signage of the gold mining sites along the way. You will get to experience a series of micro-climates and see the related wild flowers, trees and shrubs. The trails include a native plant arboretum just behind the Beekman House. You can also enjoy a self-guided audio tour of the Sarah Zigler Trail, the Jackson Forks Trail, and the Panorama Point Trail. Umi Sushi -Boasting one of the best sushi spots in Southern Oregon, if you like Sushi, Poke, Ramen or Terriyaki you’ll want to stop in Umi. With other locations in the Rogue Valley, Jacksonville is the flagship location. Right off the main road it’s easy to find and easier to enjoy! Make sure not to leave without getting the Tokyo Roll, a requirement of any Umi Sushi pit stop! Bella Union-The “modern day” Bella Union was open in 1980, operated until 1986, closed, and was opened in 1988 byJerry Hayes. In June of 2013, we “Bellabrated” our 25th anniversary, and in January of 2016 after 28 years as the propietor, Jerry sold the restaurant to two of his long term employees, General Manager Christian Hamilton and Executive Chef Tom Bates. Serving everything from pizzas, and ribeyes to Oysters and Ales on thursday night! The Liege- Serving healthy Green Smoothies and sinfully delicious Dessert Waffles. Named for the Belgium liege waffles. New eatery in Jacksonville. Opening in February 2018. Located next to the Cotton Broker (across from La Boheme & Goodbean Coffee) in the former Cheesemonger’s Wife location. C St Bistro- is a French-inspired gourmet delight just off the beaten path in lovely downtown Jacksonville. Serving ingredients from the best local ingredients available. Situated in the heart of Southern Oregon’s wine country, we offer local wines and brews in a fun, family-style setting. Serving up an eclectic mix of European, Asian and American cuisine, blended with the freshest local fare. Enjoy uniquely superior, elegant dishes in a casual atmosphere. Dine with us and taste why C St Bistro is regarded as a hidden gem in the Rogue Valley! Jacksonville Inn- At The Jacksonville Inn you will enjoy distinctive cuisine and fine dining – near Medford, Oregon. This superb restaurant features fresh seafood (salmon, Ahi, halibut, crab), stuffed hazelnut chicken, prime rib of beef, lamb, and variety of “healthy for your heart” selections. Dishes are prepared using fresh herbs and spices, many grown organically from the gardens on the premises in Jacksonville, Oregon. Thai House Restaurant – Amazing staff and amazing food, this pan-asian fusion restaurant is sure to delight with outdoor seating and overall terrific environment. La Fiesta- positioned just above the Thai house, La Fiesta boasts fantastic fajitas and great margaritas! Dine outside in the summer time and enjoy the liveliness of Jacksonville from the terrace. Kick back and sample the nachos or grab some food for the road, La Fiesta will satisfy any craving. Onyx Restuarant at Nunan Estate -Onyx is a “gastro-pub” style restaurant featuring an eclectic menu inspired by the local bounty of southern Oregon and Chinese history of Jacksonville. We are located on 3 manicured acres at the famous Nunan Estate. One of the most majestic properties in Jacksonville. The setting is a “classy casual” environment with a fully stocked bar and local brews on tap. Guests can also enjoy dining on our patio where you can gaze at the 1895 estate or simply take in the view of the valley. Schoolhaus Brewhaus- Come explore the seven acre campus and all that famous Schoolhaus has to offer. Partake in a friendly game of Bocce Ball, a cold beer in a lively and intimate bierstube, or enjoy a special family celebration in one of the many dining rooms. With authentic Bavarian style cuisine and atmosphere will transport you back in time to Jacksonville’s historic German roots. With something for everyone, you are sure to enjoy your time at The Schoolhaus. Enjoy the beautiful grounds, friendly staff, and historically renovated 1908 schoolhouse for either Lunch, Dinner or Sunday Brunch outside in the gardens. Las Palmas – Fabulous margaritas, authentic mexican cuisine paired with a great atmosphere. Las Palmas is guaranteed to be the best south of the border cuisine in town! Farmhouse Treasures – Farmhouse Treasures offers a charming collection of unique gifts, home decor, homemade fudge, specialty dressings and we are also home to Georgie Girl Jewelry—jewelry for all generations. Terra Firma -Terra Firma Home is an 8000 square foot upscale home store offering fines lines such as Lee, American Leather,Vanguard and more. Local fabric from Henry Calvin as well as Kravet, Ralph Lauren, Robert Allen, Duralee and more. Antiques , lighting, rugs and accessories. Terra Firma Home has been providing interior design and space planning services for 23 years. BlueDoor Garden Store -Here you’ll find the best in expected garden resources, including Felco tools and gloves by West County and Women’s Work—part of the largest garden glove selection in the area.You’ll also find unexpected gifts and whimsy, like miniature garden sets, the latest copy of Kinfolk magazine, rain chains, and Plant Nannies that turn recycled wine or water bottles into gravity watering devices. Willowcreek Gifts -WillowCreek is known for its well-priced, quality Sterling Silver jewelry with gorgeous natural stones, such as Moonstone, Garnet, Labradorite, Peridot, Amber, Blue Topaz, Amethyst, Opals, Pearls and more! La Boheme- To go with the ready-to-wear lines, which include chunky sweaters and jeans, La Bohème carries a variety of accessories. Slip-on sleeves are made to wear under sleeveless tops and dresses. Locally-made jewelry, hats, gloves, and scarves fill niches around the store, as do seasonal decorative items for dressing up your living space. Rebel Heart Books- As with many stories, Rebel Heart Books began as a secret dream, an if only, a someday. Since setting foot in the historic town of Jacksonville, OR over 15 years ago, the setting was the only thing we knew for sure. The Crown Jewel -“Jewelry and gifts with meaning”. Featuring handmade and exquisite items and dedicated to a philosophy of local, regional, US made and Fair Trade items. Here you are sure to find something unique – be that handmade jewelry, original art, hats, handbags, gifts or unexpected treasures. Among the finest selections of Oregon Sunstones in the state (The gemstone Tiffany claimed as it’s own, but now is available to all). A selection of jewelry with Oregon Sunstone as well as loose stones are available. Custom designs and jewelry repair available. Do not miss this adorable and affordable boutique.